See what therapists across the nation are raving about. See what Tina – and therapists just like her – are raving about. Most prospective therapy clients today begin their search for a therapist online. Are they finding you? 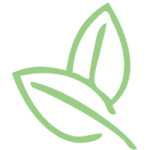 At TherapySites, we are passionate about the Therapist community and connecting you to your patients. 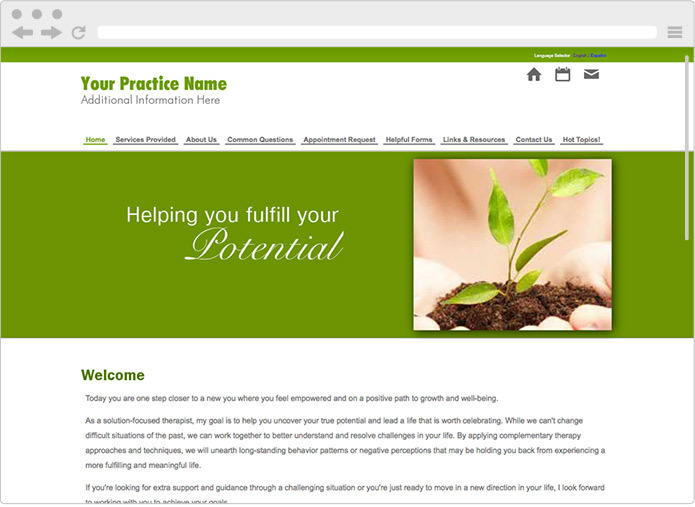 We know what you need to have a successful therapist website, and how to build an online presence that is a profitable investment for your practice. We bundle all the necessary features and services into one all-inclusive package that is cost effective, easy to launch, and stress-free to maintain. Already have a website? See the difference — over 20% of our customers transfer their therapy websites to TherapySites because they know what a great value we offer! It’s easy to transfer and we’ll help you get it done — no problem! See the difference TherapySites can make for your practice. Start a free trial today. From an optimized website to directory listings and online appointment scheduling, TherapySites gets you found in search and online, and gives you the tools to retain your clients. Our professional, attractive therapy websites are built for maximum exposure to search engines and provide the best browsing experience for your clients and prospects. 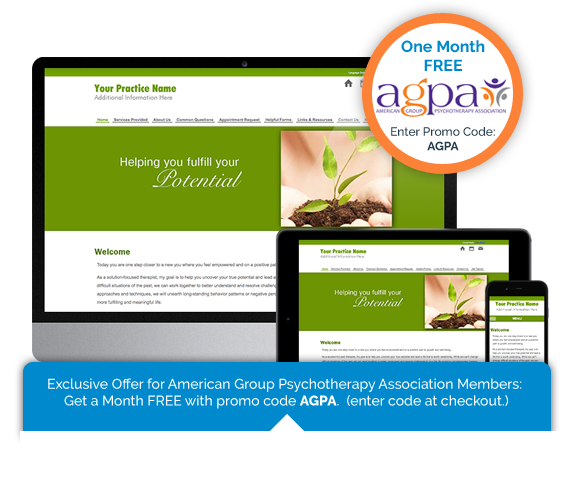 Get Listed – When you sign up with TherapySites, you get six months free directory listing in the Psychology Today Therapy Directory – the nation’s leading directory for therapists online. You are welcome to sample everything we have to offer for two weeks free and with no obligation. Go ahead – give it a test drive and see what everyone is raving about. Our attractive, professional designs are mobile responsive, with options to suit every taste. Only TherapySites gives you everything you need for a robust online presence in one easy package. No tech experience? No problem. Our tool is so easy to use, you can launch your site in under ten minutes. And if you get stuck, our friendly, knowledgeable customer care team is here to assist you with all your questions. 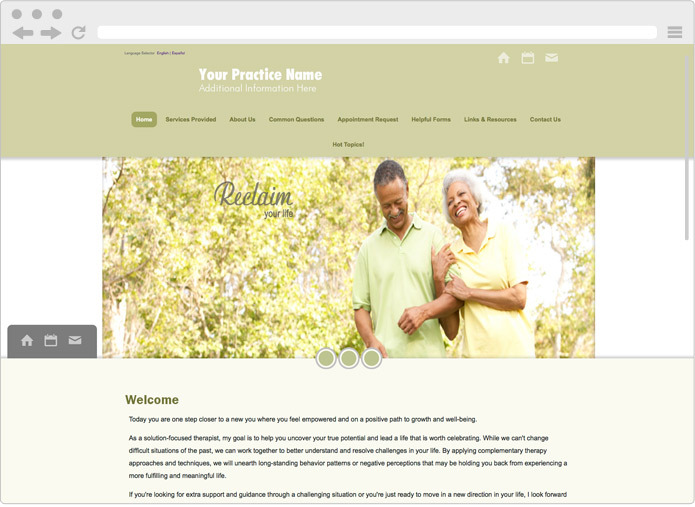 Choose from our selection of high-end, mobile friendly website designs created just for therapists. 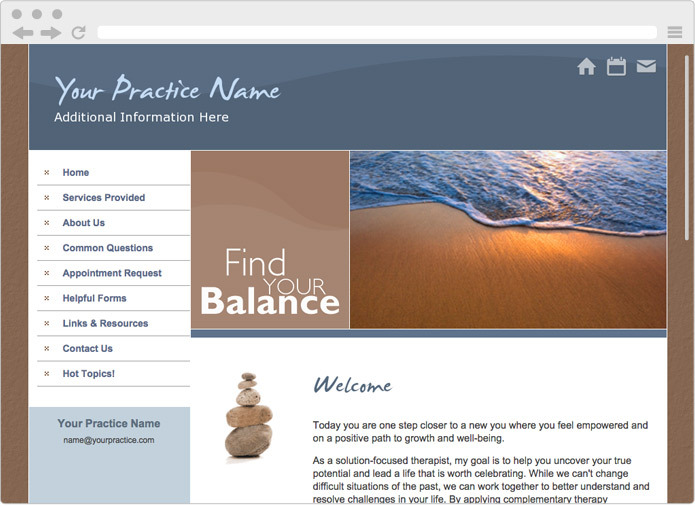 Attracting new clients and building your practice is easy with a professional online presence that’s simple and affordable. Choose your own domain name, or if you already own one, we’ll help you transfer it. 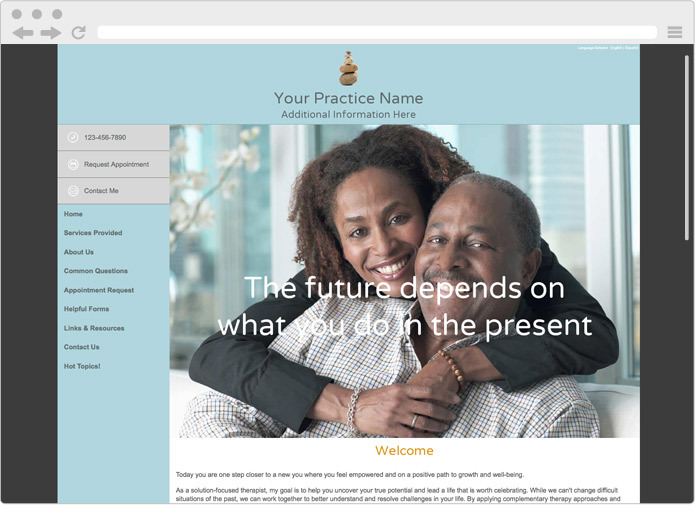 Your custom domain (www.yourpractice.com) and renewal is FREE for as long as we maintain your site. You’re in control of maintaining your website, thanks to our no-hassle editing tools. You can easily edit your template, add new pages, modify text, upload images and much more. Just point and click – it’s as simple as Microsoft Word. Say goodbye to missed calls and opportunities with automatic alerts, included in your website. Now you’ll know instantly when a client wants to schedule an appointment with you. Let me take a moment to let you know how much a appreciate your website services, and how many compliments I have received from my website!!!! People love the easy to use/navigate site that is full of relevant information. Thank you again for providing such a great marketing/info tool!!! Discouraged by the expensive of having to pay a web designer to build a website for my business, coupled with the lack of control I would then have to modify the design, I happily found TherapySites. They offer excellent websites at a low cost and they provide excellent customer service, helping me every step of the way to accomplish my goals. I can't recommend TherapySites highly enough. Thanks guys for all your hard work. Thank you for all you do. A special note of gratitude: How you have changed how I manage paperwork to clients (now down to only a couple of pages!) as well as referring people to the site. I really had not expected such changes and the impact! Thank you, thank you from the computer challenged therapist. Where have you been? I have spent the better part of $30,000 over the past 3 years trying to set up what you provide for $59.00/month....I have notified my web company to cancel my website. You deserve an A plus for friendliness and service. My practice is receiving 70 percent of my referrals after two and a half years from my website. Therapists need to treat their sites like they do their clients. The more I learn about design and maintenance the better the site functions. This has been the only marketing tool in thirty years that has profoundly and consistently worked to generate significant referrals. 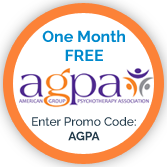 Remember, you are entitled to one month of TherapySites completely FREE as an AGPA Member – no hassles, no fine print. 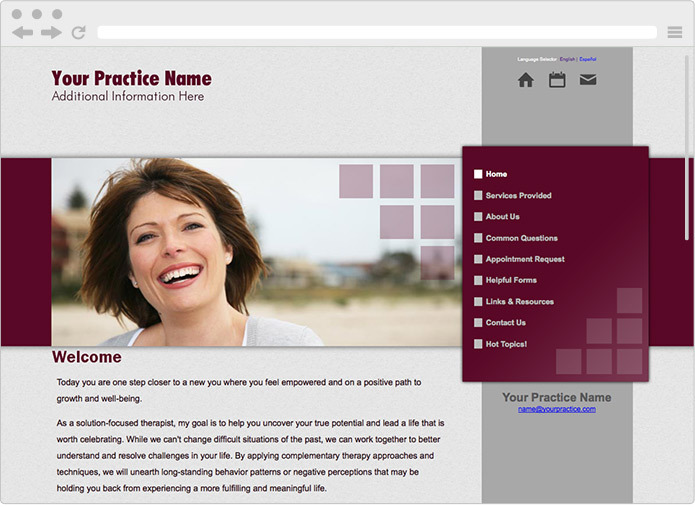 Give it a try today and see for yourself what a website from TherapySites can do for you. Use promo code AGPA at checkout. TherapySites and our partners are mutually committed to empowering Mental Health professionals to grow their business. TherapySites services are backed with a 30-day 100% satisfaction guarantee - or your money back. We give our customers a full 30 days and if they don't absolutely love their experience with the products and services of TherapySites, we offer a 100% refund on the spot. No fine print, no strings attached.